Otagiri is a name that most collectors are familiar with. It is actually a trademark for Otagiri Mercantile Company, Inc. or OMC, a Japanese company. The company was known for its use of talented artisans to produce handcrafted and hand painted items. These items, mainly porcelain and ceramic, were later sold through high end stores. 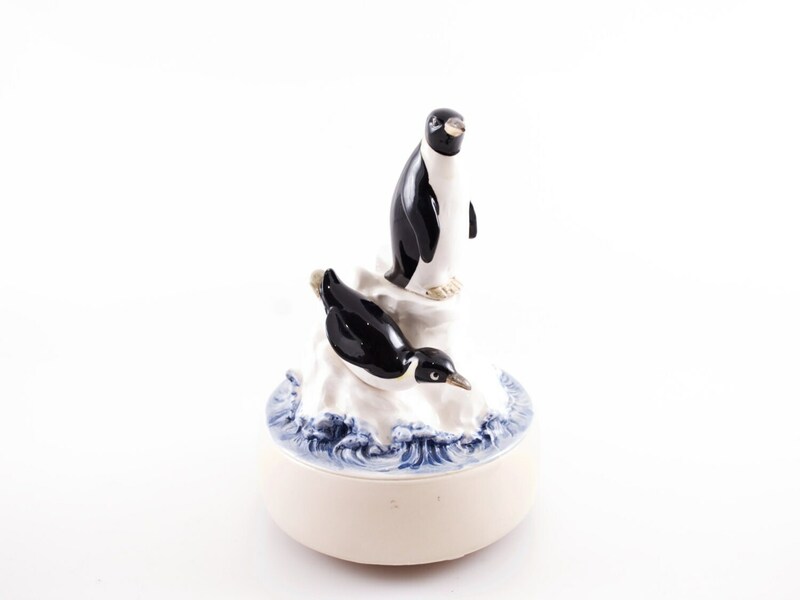 This a subperb Otagiri Penguin piece with a bonus… these penguins play music too! This would make a fantastic (non traditional) Valentine’s Day gift as it plays “Sitting on Top of the World”. The piece itself is in good vintage condition. Although it looks like it may have had a small, but very good repair that is hardly noticeable. Previous PostSomething for the Optimists or Wine Lover ?Next PostNotturno Intarsio Inlaid Wood Jewelry Box – Perfect for Valentine’s Day – Just added to my shop!